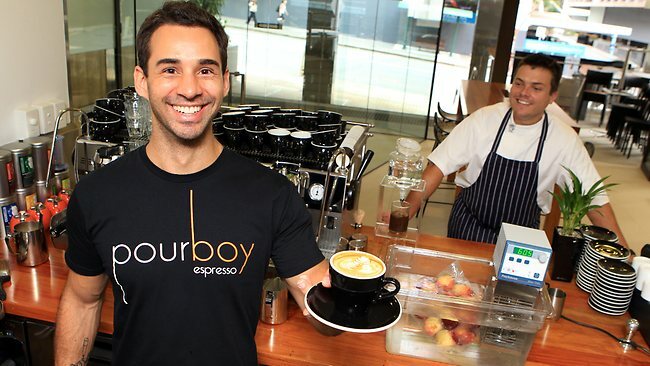 It’s a luxury having so many good cafes opening at the same time – last week it was the Corner Store Cafe, this week it’s Pourboy Espresso. On Wharf St. In the Brisbane CBD. I took a stroll from Southbank to check this place out. And it was worth the walk. The smell of fresh enthusiasm was in the air. There was a buzz. The barista, Sebastian, was obviously thrilled with how the first day was going and there was a bit of banter between the staff that showed they were really enjoying working together. And it made for a pleasant mood in the breezy glass box that Pourboy calls home. It feels modern and chic. It’s a bit like this exploded Portafilter shirt from the other day. It wins on points in the best barista tatt I’ve seen in Brisbane stakes, because it is unmistakably coffee. A rosetta is all well and good, but it could be easily misinterpreted as a pretty pattern. The portafiller tatt gave me a sense of confidence in the commitment to good coffee Pourboy is showing, and the food is meant to be pretty good too. Sorbet, pastries and quiches are baked on site. I enjoyed a cinnamon scroll with my coffee that was fresh, tasty, and delicious. Pourboy Espresso is using beans from Mecca. Mecca only use beans that are graded at 90+ (in a specialty coffee hundred point scale – this means they are good. We’re talking top 50 coffees in the world, so Sebastian told me with a bit of enthusiasm – which is also a winner when you’re picking a cafe – talk to the barista about coffee and if their eyes light up you’re probably on a winner). I had a double shot flat white on the Dark Horse blend. Which, pulled on the Synesso Cyncra, came out thick and creamy. In an attempt to supply meaningful “tasting notes” – not the industry talk that require a supertongue – I’d describe it as low acid, rich, strong and smooth with a mellow and pleasant aftertaste. The milk was perfectly silky and textured. There was no bitterness in the taste, or the aftertaste. It was superb. I followed that up with a piccolo on the featured single origin – a Guatemalan, I didn’t get the specific variety – but Mecca sell an Acetenango which sounds about right. This one was a little fruitier, a little more sparkly, with a slightly dulled-down sweet aftertaste. Really good stuff. The downside – the coffee is expensive. Drinks start at $4 a cup. Perhaps due to transit costs for getting the beans from Mecca – that involves a double handling that roasteries in Brisbane aren’t paying. And their lease is doubtless more expensive than other operations in the specialty coffee marketplace. If they keep serving up coffees like they were on the day one then their coffee is worth paying the 50c extra for anyway.